Is the Infinix hot 4 a good smartphone? Is it something good enough for you to shell out your hard earned cash to get? An X556 – They call it the “Pro” version of the “original” (2GB RAM + 4G LTE). Although I have highlighted some of the major differences between all three versions, you should still see the full details of all 3 versions. So, let’s begin with the original. … but before that, I should definitely point out the fact that the Infinix Hot 4 is presently selling for between ₦34,000 and ₦52,000 both online and offline, depending on the version you pick. First among the pack is the real hot 4. By real, I do not mean the others are fake, what I actually mean is, this was the version that was actually marketed by Infinix Mobility. Heard all those stories about the hot 4 being an awesome budget smartphone with a very “strong battery” and a fingerprint reader? What’s more, this is also the version which sites like PCTechMag, Misstechy, Innovation Village and most Youtubers did a review on. So really, how good is the device? Tell me, it’s saddening, isn’t it? To find out that this particular model which was heralded by Infinix as the best among equals does not support “ordinary 4G”. Well, the truth (as you can see) is, it doesn’t. If you are hell bent on picking on picking a 4G enabled budget smartphone, this model of the Infinix hot 4 is not for you, not for you at all. But the good news is, the PRO version (the one I talked about at the beginning of this article) does support 4G. Is 4G LTE a priority for you? Skip every single thing I’m about to write on the X557 and just head here to get the Infinix Hot 4 Pro. Nice, then it means lack of 4G is not a deal breaker for you. Apart from the lack of that support, every other thing in the network compartment is just similar to every other budget device out there. We talking support for both 2G and 3G, and two slots for throwing in two SIMs into the device. And no, the hot 4 does not come with the hybrid SIM slots that most “modern” phones (most new InnJoo products and the Hot S) ship with, it can fully accommodate two SIMs and still have a slot for a microSD. Both SIM slots (SIM 1 and SIM 2) does support 3G. What this means is, unlike most budget phones which you might have used before, SIM 1 and SIM 2 can be used to surf on 3G without having to switch SIMs. This feature may not work out of the box for you. It starts working after you install a few updates which would be pushed out to you on powering your device and connecting to the internet. So summarily, as regards network on the Infinix Hot 4 (X557), the device does not support 4G, it’s a dual SIM phone and 3G can be used on both SIM 1 and SIM 2. You weren’t expecting a metallic (or hell, ceramic) device were you? Well, that up there is simply the truth. The hot 4 ships in a plastic chassis. 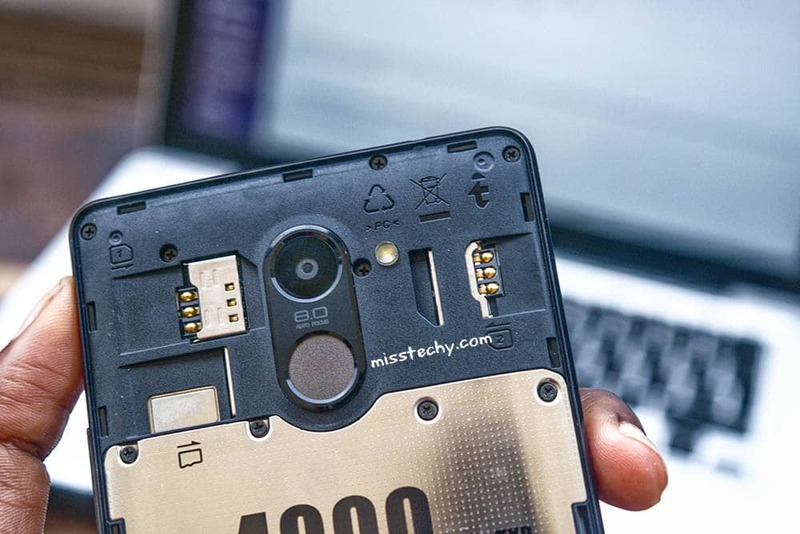 The back cover is “3d textured” (according to MissTechy and Infinix) and is prone to scratches and cosmetic wear (it’s weird using the term “cosmetic” on a tech blog *tongue out*). All that said, the device still feels sturdy for a plastic device (according to this guy) and my God, folks are complaining that the device feels kind of heavy – Y’all should just wait until you carry the Gionee M5. At 175g, the device is most definitely heavier than most (over 30g heavier than the hot 3) but when you think about it, most of it’s perceived weight comes from the battery that was coupled with the device. Another thing, if you are looking for a slim device (like a really slim one), then run far, far, far away from the hot 4. No, it’s not Nokia 3310 thick, but if you are coming from a slim device like the hot 3 or anything slimmer (Zero 2), you’d most definitely be disappointed. Initially, it’ll feel like you logging a bible (not Gideon’s o! King James!) around, but trust me, eventually, you’ll get used to it. Many people, many, many people (myself inclusive) loved how lovely the hot 3 display was (at least for a budget device), but the hot 4 would disappoint a few. It’s not bad at all, but Tobi complained about how colors felt (read: looked) washed on the display. Also in direct sunlight, it’ll be a pain to see what’s on the display unless you increase your screen brightness to the maximum. And yeah, it’s a 5.5-inch display. While to me that feels kind of too large for a “phone”, it’s what everyone is used to these days. Protection-wise, there is no Gorilla Glass or even monkey glass on the display. The IPS display ships as is. What this means is, if you are the kind of person whose device is always in concord with falling, you might want to consider picking up a tempered glass protection for this display. 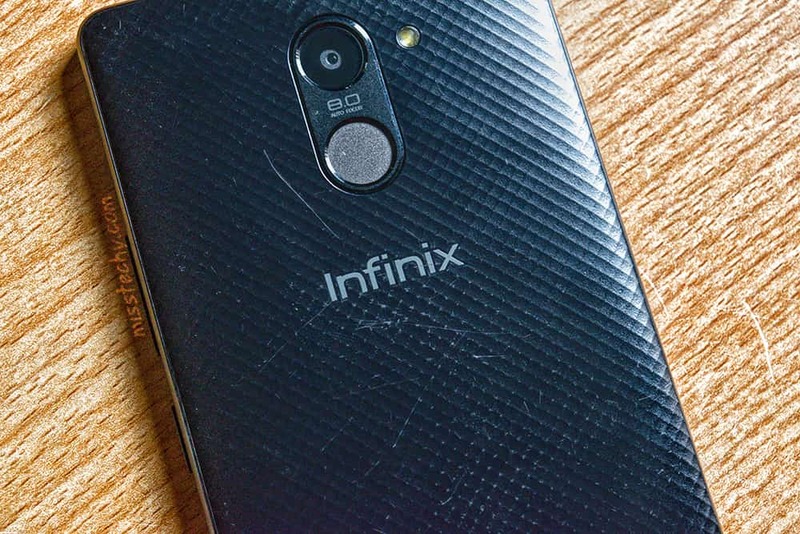 Software on Infinix devices has always been (and would continue to be) Android. The hot 4 ships with Google’s (Alphabet?) Android Marshmallow. While not stock android, I’m sure you’d enjoy the seemingly awesome UI that was imbibed into this device. Y’all should just calm down for a second! It’s a phone (a budget one for that matter) not a PC (I could be wrong, though) and by the way, if you are like most users you would not notice any difference (none at all) between a 32bit chip and a 64. With that out of the way, you should know that the processor in this device is more than sufficient to handle ideal smartphone tasks you throw at it. On performance, every single person who has reviewed this device made mention of the fact that you’d get a “lag free” performance while using the hot 4 so long as you do not overwork the device. Is 2GB of RAM really enough for a smartphone these days? Absolutely! As long as you do not care about gaming and/or multitasking. Well, if you do, go get a gaming rig (or a portable console) already! – they are now dead cheap so I see no reason for your not getting one. This part is usually the deal breaker for a lot of folks (especially the females, except this one). Yes, the hot 4’s camera is good enough for Sunday snaps during the day, and for Snapchat? Well, it’s pretty manageable. Everybody who reviewed this device seems to be happy with the picture quality from the back camera under well-lit conditions but my oga (over here) is not happy with the camera’s performance under low light conditions. Want a better camera device? Check out the Camon CX. The hot 4’s battery capacity is REALLY large (on paper), but how well does it cope with real life situations? The 4000mAh battery on the Hot 4 does an excellent job! The Hot 4 Lite ships with just 1GB of RAM. The Hot 4 Lite does not possess a fingerprint reader. Every other feature except those two mentioned above is simply a replica of it’s “senior brother”. 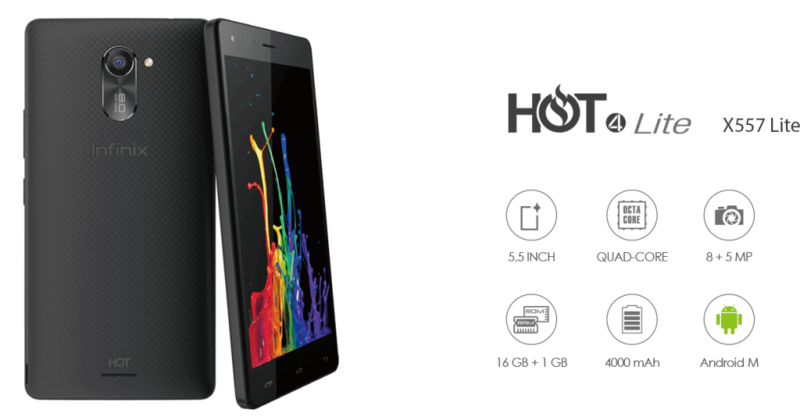 Should You buy The Infinix Hot 4 Lite? Normally, I would state that you “run away” from the Hot 4 Lite, but now that I think about it, not everybody deserves to use the hot 4 (2GB RAM). By the term “deserve”, I mean not everyone would truly use the 2GB RAM version to its full potential, its limits. Some folks would be under-using the smartphone. So for these kinds of folks, the logical choice should be (by all means) the hot 4 lite. You catch my drift right? How about we say excellent! Yup, I’m not kidding; the hot 4 is just excellent for its selling price. In fact, it’s high up my list of the best budget devices in Nigeria at the moment. Only a few devices come close in terms of value. Fine. Just let me know using the comment box below. You currently own and enjoy this device? Let me (and the world) know as well! No problem. Shoot me a message from here. Remember: If you are considering settling for this smartphone, and you not among the “list of folks” I mentioned above, please try getting the Hot 4 (2GB RAM) not the Infinix Hot 4 Lite. Trust me, in the long run, you’d be glad you did. Wonderful work, man. I read behind the lines, such a catch. Kay, your writing prowess ??????????? ?